You are currently browsing the tag archive for the ‘Bantam’ tag. Liquid Gold is a sequel to Roberts’ novel Splashdance Silver, but could probably be read independently with no real difficulty. 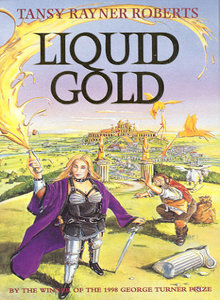 Liquid Gold is the better of the two novels, and although it’s a little hard to be sure (since I *had* read Splashdance Silver), I think it explains most of what you’d need to know if you read this novel alone. 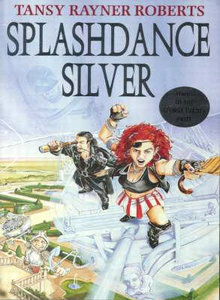 Splashdance Silver is a pleasantly amusing read with a consistent dash of humor throughout the novel. It tells the story of Kassa Daggarsharp, and her oddly assorted crew – or perhaps that should be hangers-on. When the story opens, Kassa is enjoying herself, making a living dancing in taverns. But within pages, she has received tidings from her father, the pirate Vicious Bigbeard Daggarsharp. It’s a pretty traditional letter – if you’re reading this, then I’m dead… Bigbeard has willed Kassa his trove of pirate silver. Inconveniently, he’s failed to mention exactly where it is. 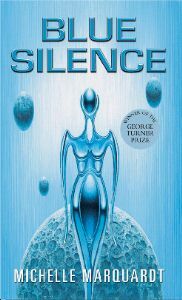 Blue Silence is a confident and assured science fiction novel, which I enjoyed a great deal. The novel focuses on Senator Maya Russini, and is told from her point of view. Maya is a strong character; I realised at the end of the novel that Marquardt had given little indication of Maya’s age or appearance, and not a great deal of information about her past. Despite this, I had a strong sense of her personality and who she was, and I was definitely on her side for much of the novel. Marquardt has an eye for characterisation; her major characters were all strong, distinctive and interesting. In Fivefold, five individuals find themselves manifesting strange gifts, after accidentally stumbling across a ruined cathedral in Yorkshire. They seem remarkably willing to take these odd gifts and their (rather freaky) manifestations in their stride. However, they soon find that they are hunted by the mysterious Lords of Severity, and apparently protected by a Fivefold Cabal that has links to an equally mysterious Order of the Brightening Dawn. Much dashing around England follows, along with sudden and deadly attacks, both physical and metaphysical. Rather than seeking any kind of help from the authorities, or family and other friends, the five friends allow themselves to be dragged around the country by the uncommunicative Fivefold Cabal, and pulled deeper into an ages-old conspiracy. Although I didn’t enjoy Fivefold very much, it is a novel that has the potential to be enjoyable for the right audience in the right mood. One of my difficulties with it was the sheer stupidity of the act that is utterly necessary to get the plot moving – but it’s on a par with watching a horror movie and knowing with utter certainty that someone is going to go into that dark space alone. If you’re in the right mood, you can still enjoy the movie.